Get your early morning flight on a Saturday morning (7am) and you will arrive in Bydgoszcz (pron: bitgosht) at 10:20. BYZ has some unique museums, breathtaking architectural designs placed side by side with the Art Nouveau buildings, international festivals and the water, with its trams, boats and other vessels which entice and welcome one and all to have a ride and admire the city from the board. It’s all there, in Bydgoszcz, the city not to be missed. The Brda River, flowing through the city, is fringed by the many tourist spots, appreciated by the holiday-makers and locals alike as it does not only offer a chance to have a romantic stroll along its banks, but also see a lot of advanced hydrotechnical objects. 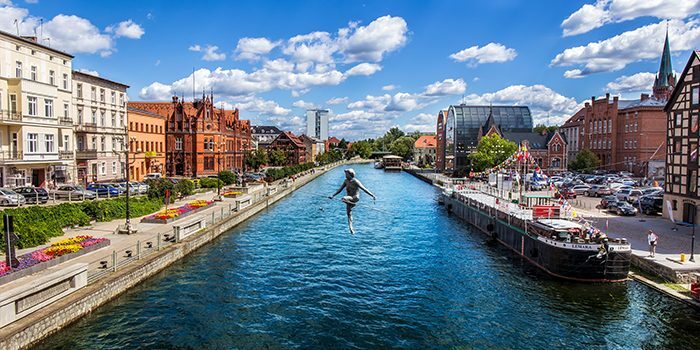 Undoubtedly, the strongest points of the city are countless sports events such as Triathlon Bydgoszcz, Woda Bydgoska (Swimming Competition), Wielka Wioślarska (Great Rowing Regatta), or a combination of water and music festivals, i.e. Rzeka Muzyki(the River of Music), or Bydgoszcz Water Festival “Ster na Bydgoszcz”, just to name a few. Once more it’s the water that brings them all to life. 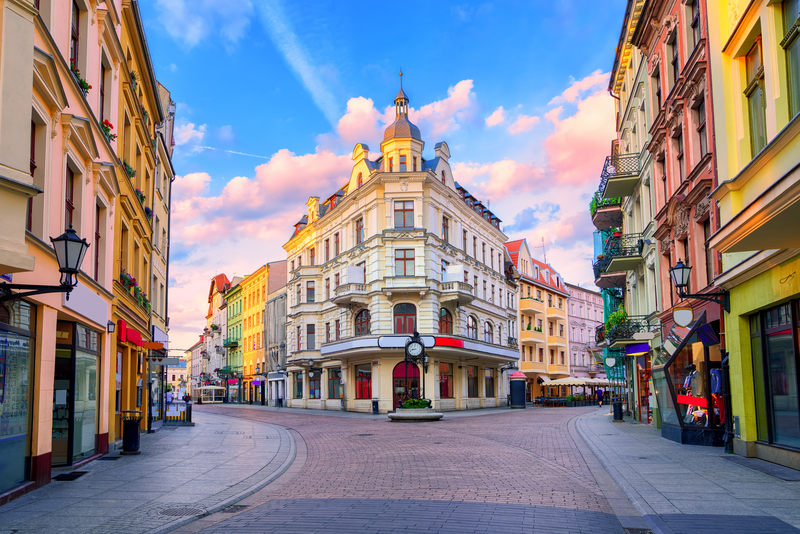 When tired of fitness and sports, you can venture some sightseeing and stroll along the city to see both the antique (Polish Post Office building, Fara or Klaryski Churches) and the modern (Glass Granary Building, the Opera House or the Marina). Those tired of the water, yet inquisitive and looking for more detailed knowledge can head for one of the many museums, offering a wide variety of exhibitions, from the history of the city (the Old Granary), to the one and only Exploseum, Soap and Dirt History Museum or one of the Art Galleries dotted around the Old Town. Music and film festivals also will tempt you and appeal to all culture-vultures, to name just the few: Camerimage, Bydgoszcz Opera Fesitval, Premiere Festival, Bydgoszcz Music Festival, Drums Fusion, Chamber Music Festival, Musica Antiqua Europae Orientalis, Animocje International Animated Film Festival. Day 2/3 Pick up local transport (you can get there by Train or bus) and head to the UNESCO World Heritage city of Torun which is 26 miles om BYZ. The area consists of three historical, medieval districts, formerly separate units: the Old Town, the New Town and the Teutonic Castle. More details of the city Famous for its native son, the astronomer Copernicus, Torun was founded by the Teutonic Knights in the 13th century. You can still see the ruins of their castle, left pretty much unchanged from when it was destroyed by disgruntled medieval townsfolk. Torun was one of the few Polish cities to escape major damage in World War II. Its beautifully preserved Old Town is a UNESCO World Heritage Site. Don’t miss the striking Old Town Hall. Torun is also famed for its gingerbread. Copyright © 2019 Glasgow Prestwick Airport Limited. All rights reserved.